If you work and play with Microsoft's various online and desktop apps and services, the company has a serious holiday deal for you. 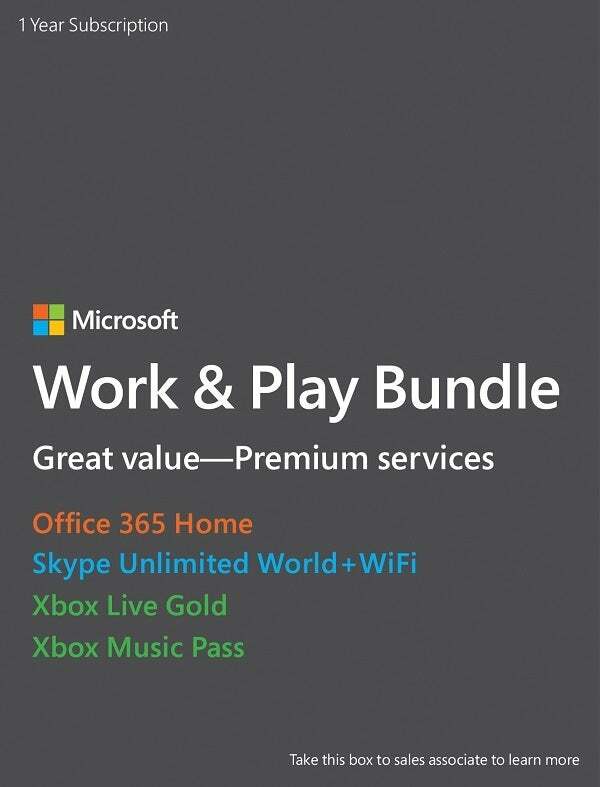 Microsoft recently announced the aptly named Work & Play bundle, which gives you a 12-month subscription to Office 365 Home, Xbox Live Gold, Xbox Music Pass, and Skype Unlimited World + Wi-Fi for $199. The new bundle is available only from U.S. Microsoft Store retail locations and thus only to U.S. residents. 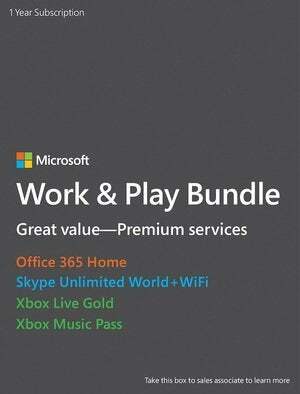 The Work & Play bundle is on sale now until January 4, 2015. Why this matters: Apple, Google, and Microsoft are fighting hard to keep customers in their respective ecosystems both on the desktop and online. Compared to its competitors, Microsoft has a much larger suite of services to sell as yearly subscriptions. With the Work & Play bundle Microsoft shows just how serious it is about wooing new subscribers. The new bundle cuts the cost of all four services to more than half, as buying each service separately would set you back around $450 every year. For the most part, you get the standard offerings each service offers. With Music Pass you get unfettered and ad-free access to Microsoft's Xbox Music catalog. Xbox Live makes the Xbox worth using online, and the Skype deals are great if Skype is your primary communication path. The one oddity is Office 365 Home. Microsoft says that as part of the deal you get 1 TB of online cloud storage with your yearly subscription. But recently, Microsoft announced Office 365 subscribers would get bumped up to unlimited OneDrive storage, which currently maxes out at 10TB but can be increased if you email a request to the company. We've dropped a line to Microsoft to see if Work & Play bundlers will also get the unlimited storage option on OneDrive. Even so, 1 TB is still a heck of a lot of online storage for most people, and regardless of that detail Office 365 Home still gives you access to Microsoft's Office suite on up to five PCs, five, tablets, and five phones. Since you have to buy it from a retail store, Microsoft's new bundle annoyingly appears to be physical gift cards you buy at the cash register. It's hard to quibble with a great deal like this, but it sure would be a lot easier if it could be bought online and automatically added to your Microsoft account. Sure, that would inevitably mean the deal would be sold to wily Microsoft fans outside the U.S. who know how to game the system. Nevertheless, it would still be far more convenient for the target audience.